Apple and fall spices are smells I crave when the fall months first hit. 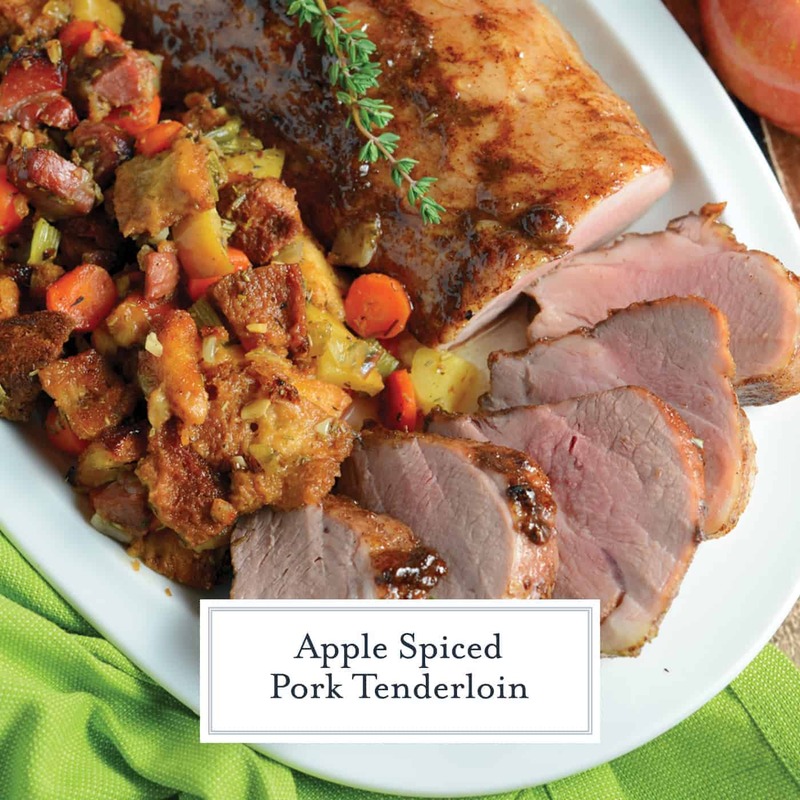 Apple Spiced Pork Tenderloin encompasses all of these flavors and fragrances, making it one of my fall and winter time favorites! 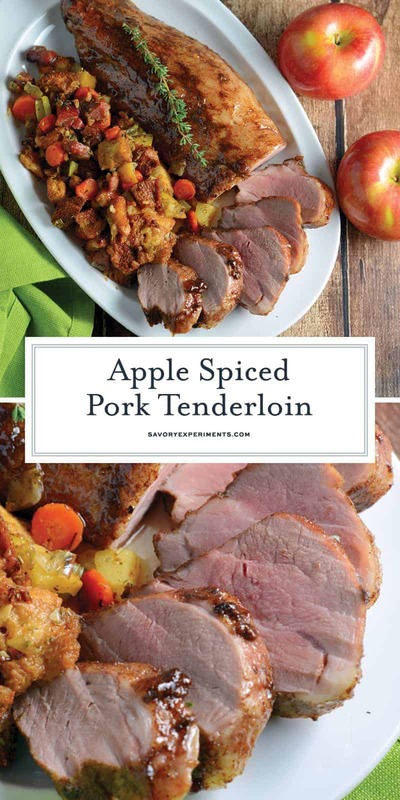 Apple Spiced Pork Tenderloin is a pork tenderloin recipe that will blow you away with aromatic spices and an apple jelly glaze, surrounding with fresh apple and ham stuffing, all cooked on the same baking sheet. 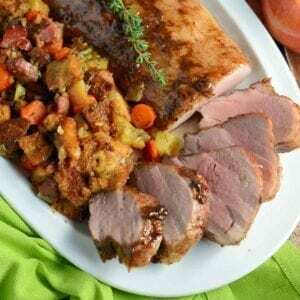 Apple Spiced Pork Tenderloin and Stuffing has been one of our family favorites for many years. 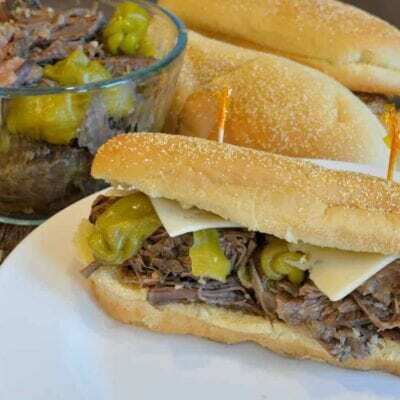 Paired with a side of Garlic Dill Mashed Potatoes, Easy Dinner Rolls and a green salad with Balsamic Vinaigrette, it is the ultimate Sunday dinner. , allowing you hands-off time to make your other accouterments. The original one-dish meal. This recipe was cool before the term ever became fashionable. 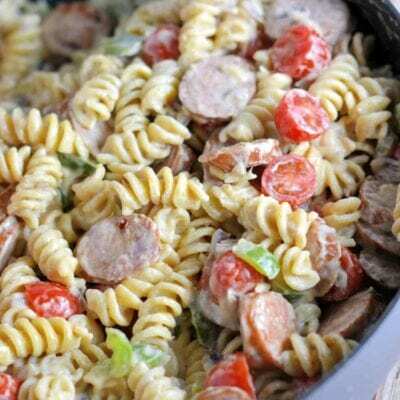 The flavor and smell of this dish embodies everything about fall and winter, but we tend to make it year round. The aromatics alone will have you leaving your house just so you can come back in and smell the intoxicating scent. There are two types of people in the world, those that like a soggy stuffing and those who prefer a crunchy stuffing. Same goes with French Toast Casserole. While I enjoy a crunchy stuffing, you can add a little more apple juice for a softer mix. You can also make double of the pork glaze, simmer half and ladle it over the sliced tenderloin. 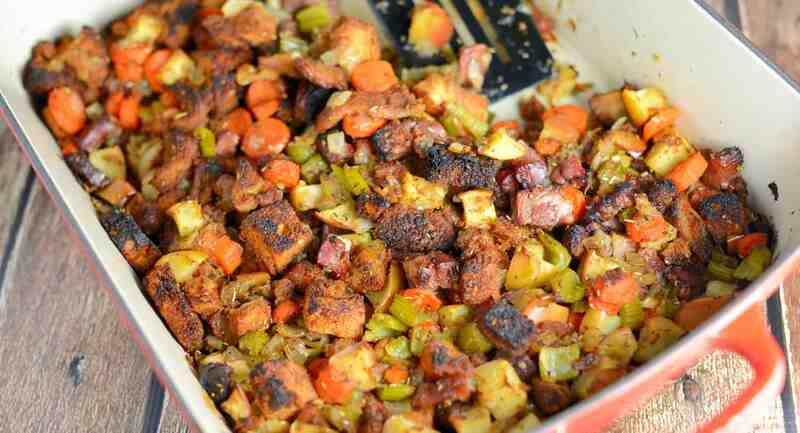 Sometimes I also make a little extra stuffing (my family just loves it!) and cook it in a separate dish. To prepare stuffing, preheat oven to 400 degrees. Arrange bread cubes in a single layer on a rimmed baking sheet. Season with 1/ teaspoon fine sea salt and finely ground black pepper. Bake for 6 minutes, turn and bake for an additional 4-5 minutes, or until dry and crispy. Melt butter in a large frying pan over medium-high heat. Add diced ham, white onion, carrots and celery. 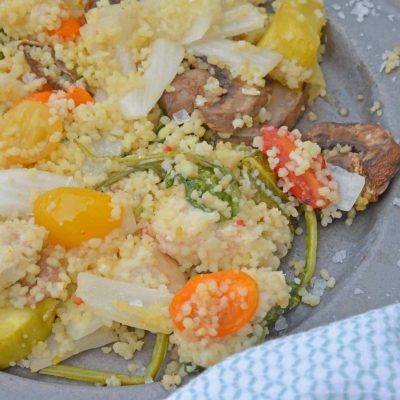 Sweat vegetables until they start to soften, but are still semi-firm. Remove to a large mixing bowl, toss with dried bread cubes, thyme, rosemary, micrograted garlic and apples. Mix the apple juice directly before arranging on pan around the roast. Set aside. To prepare the roast, mix all dry spices in a small dish. Rub pork tenderloin with extra virgin olive oil and then spice mixture. 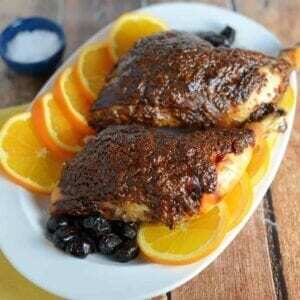 Place onto broiler pan and return to 400 degree oven for 30 minutes. Meanwhile, combine apple jelly, fresh ginger, lemon zest and garlic in small sauce pan over medium heat. 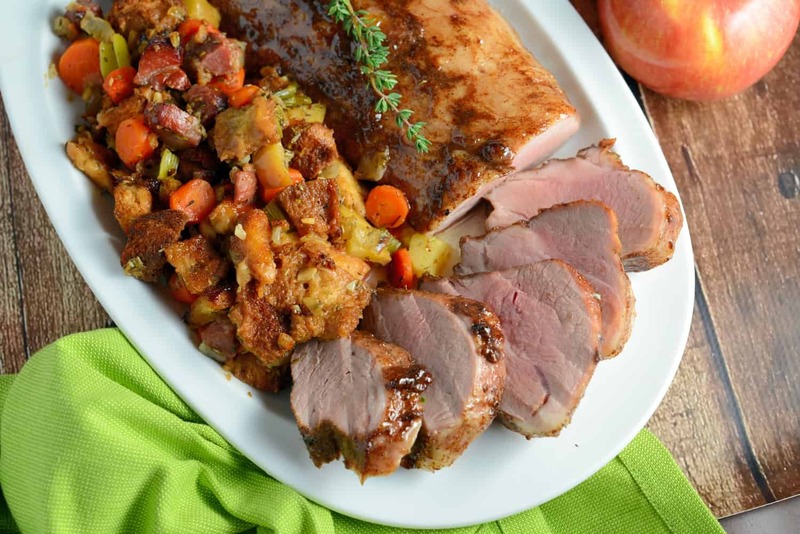 At 30 minutes, baste tenderloin roast with apple jelly and arrange the stuffing mix (tossed with apple juice) around the roast. Cook for 15 minutes. Remove and baste the roast with apple jelly mixture again. Gently toss stuffing. 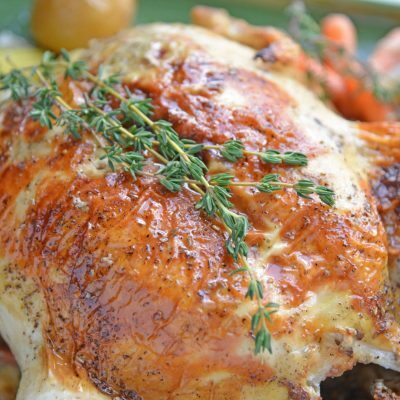 Return to oven for 15 minutes, or until internal temperature of roast reaches 155 degrees. Remove and let sit for 5 minutes before slicing and serving . 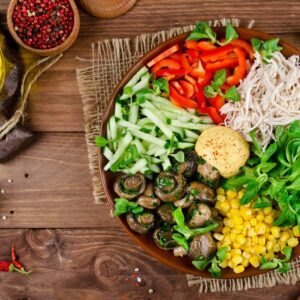 It is helpful to dice all vegetables in a uniform size so they will all cook evenly.